SPIs are a model of micro-credit banks that COAGRO has been implementing and supporting since 2008. It is a fundamental part of the strategy to improve household economies of COAGRO's lower-income populations and their small-scale economic activities. The micro-credit banks are independent organizations owned by people who typically have small-scale economic ventures. They are directed and controlled by their members and partners, and function like a typical community bank: practicing micro-lending and receiving savings. In this system, the members and partners come together for a common purpose and invest their capital to solve their local needs. 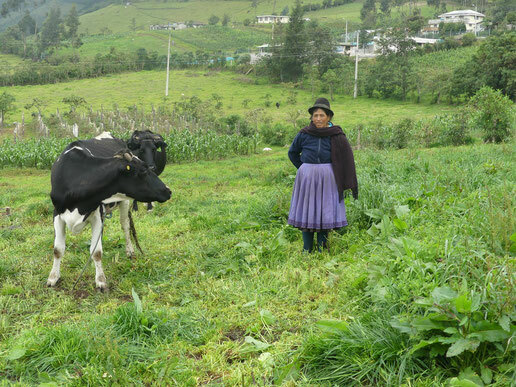 The main beneficiaries are women in the rural areas of the Pichincha and Imbabura provinces. The SPIs belong to vulnerable families whose economic activities involve handicrafts, agriculture, and managing and partaking in other rural businesses. Thanks to the micro-credit banks, women and their families can generate local enterprises in agriculture and livestock by yielding higher milk and organic vegetable production. They are also able to finance other projects to improve the living conditions of their families.